Historically the universal caliphate came to an end in 1924 when Mustafa Kemal Atatürk secularized Turkey. Notwithstanding the ominous and pretentious claim of the Islamic State in 2014, there is in fact a global organization which not only represents Muslims throughout the world but subtly is diffusing Islamic draconian tenets, too, with the hope of creating a sharia-based society: The Organization of Islamic Cooperation (OIC). The Organization of Islamic Cooperation, as the world’s second-largest international nongovernmental institution, is a powerful voting bloc in the United Nations. As with the Muslim Brotherhood, it upholds the doctrines and goals of global Islamic supremacy based on the Quranic teachings and the traditions of the Prophet Muhammad. The Kingdom of Saudi Arabia appears to have the leading influence in the OIC, as per its flag and logo, which has a crescent moon encompassing the entire globe with the Ka’aba in the center, simulating the Saudi Arabian one, which incidentally was the only nation among all the embassies in Washington, DC that did not lower its flag on 9/11. 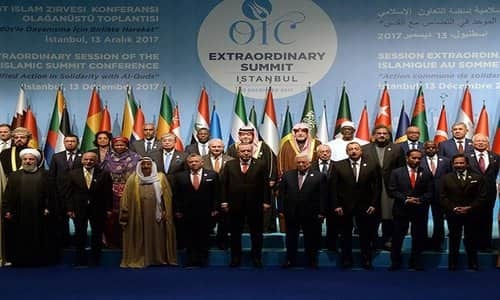 Under the guise of diffusing justice in the Middle East, such as seeking an independent and sovereign Palestinian State, the OIC has opened its Pandora’s box of Islamic infiltrators in the United States and in Europe. This helped expand and strengthen its worldwide network of agents, thereby solidifying the member-states’ influence within the international community. As a result, since the turn of the century, the OIC has been able to employ one of its primary jihadist objectives, getting the UN to coerce Western nations to criminalize Islamophobia, i.e., penalize any criticism, negative stereotyping, or deprecation, even if true, of Islam or the sharia. Unlike the Muslim Brotherhood, which carries out its influence over people through both open and concealed operations, the OIC exercises its authority in its self-invested sovereign right to act and intervene for Islamic states and Muslims in non-Islamic nations. Not only does it enjoy unlimited power through the union and cohesion of all its bodies, but also to this adds the infallibility conferred by religion. In practical terms, it has become the “unofficial” universal caliphate. After the OIC orchestrated protest demonstrations and violence associated with the Danish and French cartoons depicting the Prophet Muhammad in 2005 and 2006, the EU was able to justify norms criminalizing actions falling within broad definitions of religious defamation, discrimination, and Islamophobia. In March 2011, the UN Human Rights Council (UNHRC) passed Resolution 16/18, which called on all countries to combat “intolerance, negative stereotyping, and stigmatization of religious belief,” but stopped short of mandating criminal penalties, even though it did recognize the Muslim Brotherhood invented the concept of Islamophobia. With the backing of then-President Obama and Secretary of State Hillary Clinton, OIC-sponsored Resolution 66/167 quietly passed the 193-member UN General Assembly on December 19, 2011. This was widely viewed as marking a significant step toward making defamation of Islam and Islamophobia recognized legal concepts that could be criminalized. Whether they are so-called extremists or benevolent Islamic organizations, a universal appeal or a crusade on the part of Muslims to defend their cultural and political identity has been propelled by the OIC, which has won the right for Muslims to refuse to be assimilated into the Western society in which they live. This is why the OIC still refuses to condemn sharia-based norms that sustain the inequality between a Muslim and non-Muslim and that of man and woman.